Successfully Added Silicon Rubber Numeric Keypad - Flexible Black Keypad to your Shopping Cart. Numeric keyboard made of soft but extremely durable silicon rubber. 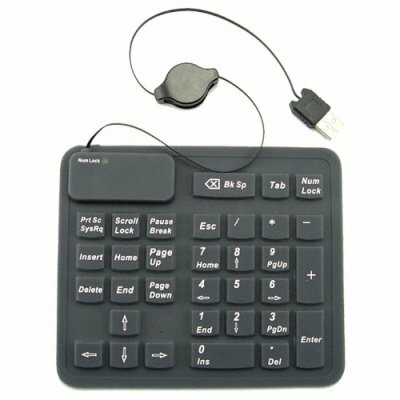 Standard sized numeric and navigation keypad made for accountants, bookkeepers, or keyboard warriors who need a reliable computer numeric keypad that will not wear out or fade like a normal keyboard. With raised, responsive keys that are soft on the fingers, this is a joy for anyone whose hands hurt after a long day of typing. Simply plug it into one of your computers USB slots and place it on any flat surface and you are ready to start typing away. Great for travelers, this keypad is durable and can withstand spills and other types of usual and unusual abuse. Buy yours at an unbelievably low wholesale price, and don't forget to log in and see even greater discounts available by buying in bulk. Spill-proof silicon rubber numeric keypad. Lightweight numeric pad with responsive raised keys.